Happy St. Nicholas Day! My friend Carl Sommer worked on a graphic novel for the occasion, and you can view it in its entirety online at Catholic Heroes of the Faith. Here’s my take on ol’ St. Nick — as a patron of a particular kind of ecumenical dialogue. 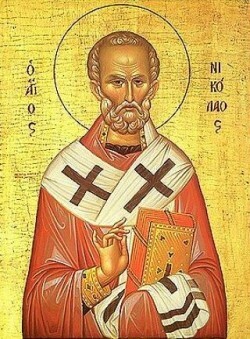 Now, don’t get me wrong: I have a great devotion to St. Nicholas. In fact, he’s one of the handful of saints whose intercession I invoke every day of my life. But his was not the only way the Church Fathers approached ecumenism. Consider Pope Zephyrinus, in the second century. In the midst of fierce persecution from imperial Rome, the poor guy also had to face heresies and moral lapses within the Church. The situation grew to scandal proportions, but he endured it patiently. In fact, some rigorists thought he was far too patient with heretics and sinners. The rigorists’ own holy impatience soon turned ugly — and unholy — as they declared the Pope anathema and the worldwide Church his “sect.” (I love it — the sect of the Catholics.) Meanwhile, they dubbed their own little congregation “the Catholic Church.” They elected history’s first antipope — a man who, in his rather extreme aggression, tended to over-correct the errors of the heretics and fall into the heresies on the opposite side of the tracks. St. Zephyrinus remained steady and orthodox. He knew when to pull his punches, just as St. Nicholas allegedly knew when to throw them. As someone once said, there is “a time to rend, and a time to sew; a time to keep silence, and a time to speak; a time to love, and a time to hate; a time for war, and a time for peace” (Eccl 3:7-8). Still today, it’s easy for armchair pontiffs to grumble about the perceived weaknesses of the real popes. It’s the real ones who have the thankless job of discerning the seasons of the carrot and the seasons of the stick. We should avoid grumbling and learn patience from history. The Church of the Fathers suffered many divisions — schisms, heresies, and outright apostasies. There were certainly occasions for excommunication, but prayer for unity was always in season. And we can be sure that all those prayers of the Fathers will one day be answered. Many, in fact, were answered, in short order and rather definitively, as the ancient heresies exhausted themselves. Sometimes it took centuries, but the Montanists, Marcionites, Arians, Apollinarians, and Monothelites all went the way of the wooly mammoth. One of the most painful divisions in Christian antiquity was the schism that rent the “Persian” East from the “Roman” West. It happened with the Nestorian schism in the fifth century, when a serious doctrinal dispute gained further momentum from cultural and political tensions. The division has lasted now for a millennium and a half. There are Catholics, no doubt, who would consider this division a “cold case,” meriting no further attention. But Pope John Paul II chose to give it his closest attention. He encouraged the dialogue. And in 1994, he signed a “Common Christological Declaration” with Patriarch Mar Dinkha IV of the Church of the East, essentially resolving “the main dogmatic problem between the Catholic Church and the Assyrian Church.” In 2001, the Pontifical Council for Promoting Christian Unity went a step further and approved the sharing of Communion between the (Catholic) Chaldean Church and the (so-called Nestorian) Assyrian Church of the East. We should marvel that reconciliation should proceed so swiftly after a millennium and a half of alienation. We should marvel at the stunning fact of intercommunion. And, again, we should learn from history: ecumenism proceeds best on God’s schedule, not ours. We should pray for unity. And we should rest assured, as the Fathers did, that our prayer will be answered; for it is the prayer of Jesus (see Jn 17:11). Oh, and it’s probably best if we hold our punches. That pugilistic Santa Claus story is almost unique in ancient Church history, and scholars tell us it’s of dubious origin anyway.